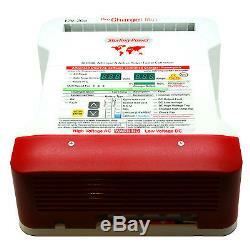 Sterling Power Pro Charge Ultra - Superb Spec 3 Output Marine Battery Charger - Model PCU1220 (12V/20 Amp). Award winning 3 output marine and leisure battery charger. Simple plug'n'play system with 11 different pre-programmed cycles. Thermostatically controlled fan cooling system. Twin digital displays for Amps and Voltage plus 32 LED info display. Quality construction with rear metal plate and durable plastic casing. Designed for vertical mounting with splash/drip protection (IP22 class protection). Optional remote control and monitoring panel. Measures 215mm (w) x 260mm (h) x 90mm (d) and weighs 2Kg. 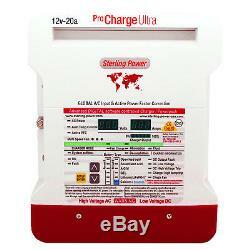 Other models of the Pro Charge Ultra are available. 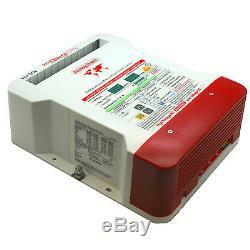 12V/10A, 12V/30A, 12V/40A, 12V/50A, 12V/60A, 24V/20A and 24V/30A. For technical assistance on marine power, please call our expert sales team free on 0800 310 2100. All orders are despatched form our Enfield warehouse, which stocks over 2,000 product lines. If you simply change your mind, you can return and item to us within 7 days of receipt - please remember than in such cases you are liable for the return carriage costs. Please remember we are only human and that occasionally things might go wrong; if so we will do our best to rectify matters as soon as possible and rest assured we will learn from our mistakes. The item "Sterling Power Pro Charge Ultra PCU1220 12V 20A 3 Way Marine Battery Charger" is in sale since Monday, November 17, 2014. This item is in the category "Vehicle Parts & Accessories\Boats Parts & Accessories\Accessories".